A year has passed since I last posted a Carl and Jerry high-tech saga. 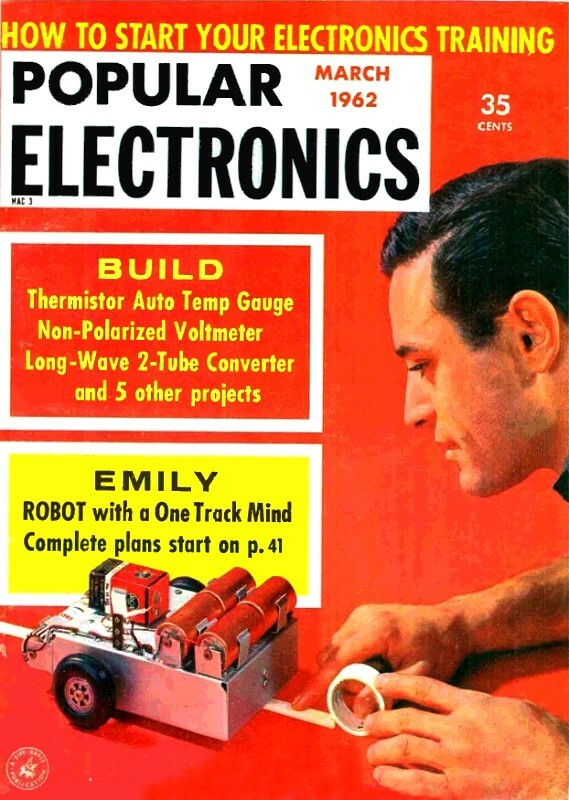 John T. Frye created the duo of teenage sleuths in 1954 for the very first issue of Popular Electronics magazine. More than 100 adventures carried Carl and Jerry from high school through college. Their practical jokes, crime solving, and mystery investigations incorporated microphones, timers, cameras, Ham radio, transformers, metal detectors, remote controllers, home brew circuits, photodetectors, and a host of other gadgets that could be pulled from a stash of parts in Carl's or Jerry's basement workshop, or borrowed from a friend. 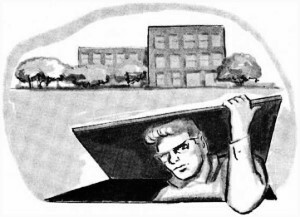 In this story, Carl and Jerry, now students at Parvoo University in Indiana, have an unexpected confrontation with a radio operator while exploring a campus construction tunnel. Jerry suspects it might be a nefarious international spy making contact with comrades somewhere in the world. Have Carl and Jerry thwarted yet another attempted crime? Read on to find out. A comprehensive list of all the Carl & Jerry episodes posted on RF Cafe is at the bottom of the page. March had come in like a lamb, but Carl and Jerry were not feeling very lamb-like. The unseasonably warm evening breeze wafting gently through their open window on the third floor of H-3 Residence Hall on the campus of Parvoo University filled the boys with a strange inquietude. Jerry was sitting at his desk making a desultory attempt to study while Carl paced restlessly back and forth listening to an AM-FM transistor radio he carried in his hand. "Will you quit switching that thing back and forth between AM and FM?" Jerry demanded. "You're making me nervous." "I'm nervous; that's why I'm doing it," Carl retorted with a grin. "I'm trying to see, moving to and from the window, if the building's steel framework has more shielding effect on AM or FM reception. Remind me to try this out in that cave down along the river when we're home this summer. I'd like to see what effect a layer of earth has on the two modes... Hey! We don't have to wait till then. How'd you like to go tunnel stomping?" "Tunnel stomping. A couple of fellows at the library this afternoon were telling me they had a whale of a time last night exploring the steam tunnels that run around beneath the campus. They told me how to get in and everything. And I can check out this AM-FM reception bit while we're at it. What do you say?" "Well, I dunno," Jerry said slowly. "Parvoo's powers-that-be might take a dim view of our prowling around down there where we have not business." "Aw, come on!" Carl coaxed. "I've got to do something different tonight or I'll flip. This is no evening to sit cooped up in a room with a bunch of books. We won't be caught. The fellows never met a soul down there last night." "You twisted my arm!" Jerry exclaimed as he took a flashlight from a drawer and put on a jacket. "I feel in the mood for a little adventure myself." Carl snatched up a campus map and snapped a pedometer on his ankle as they headed for the door. Outside, under a starry sky, Carl led the way south for several blocks, turned east, and finally proceeded south again. "Keep going and we'll soon be outside the city limits," Jerry finally warned as he trotted to keep up with his lanky chum's long strides. "That was the Bull Barn we just passed on the right." "It's only a little farther," Carl assured him -"Ah, here we are!" Several flickering red lanterns outlined a large opening in the ground. The boys let themselves down into the excavation and pushed aside a heavy canvas curtain to reveal a long, narrow passageway leading back toward the campus. 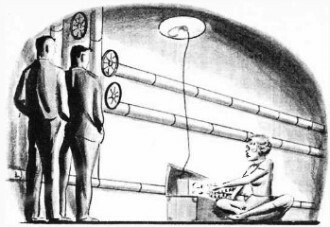 "This comes from the new heating plant on the edge of the campus," Carl whispered as he zeroed his pedometer; "it joins the tunnel system already in use by the old plant. Let's go." At first the boys advanced slowly, quietly , and cautiously; but as nothing happened and they met no one, they became bolder and more reckless. They soon found that they did not need their flashlight. Along the top of the tunnel ran a row of lights that could be turned on and off in sections. The boys simply lit a string of lights ahead and went to the end of it; then they darkened the tunnel behind them and turned on the next section of lights. When they encountered the first side tunnel, they followed it until they were stopped by a locked fireproof door. By this time they were so exhilarated by a combination of adventure, spring fever, and the oppressive quietness of their surroundings that they beat on the iron door with their fists and shouted greetings through it; but the only answer was the echo of their shouts coming back from the main tunnel. Carl's map and pedometer were not needed to keep track of where they were. Every so often an opening in the roof of the tunnel was covered by a rectangular iron plate. By raisin one side of this plate very cautiously, a foot or so, they could get a look at the campus and see where they were. They made a game out of it. The first boy who spotted one of these openings would shout, "Up periscope!" The, while they chuckled at the joke that never seemed to grow old, the other boy had to climb up and take a cautious peep around. They lost all track of time as they followed the tunnel north to where it joined the tunnel coming from the old heating plant in a great collection of valves, pumps, and other machinery. Turning left at this point, they followed the tunnel past the Agricultural buildings and then turned back south again beneath South University Drive. "Hey," Jerry suddenly exclaimed, "you forgot to try out your radio. Turn it on and let's see what you can pick up." Carl turned on the little receiver, but all he could hear was a soft buzzing sound. "Maybe that noise is coming from the lights," he suggested. "Cut them off and let's see if it stops." Jerry snapped off the light, and the boys stood there in the pitch darkness. The sound did not change, but before Jerry could turn the lights back on there was a grating noise and a dim rectangle of light appeared almost overhead as someone opened a hatch cover. Instinctively the boys retreated quietly back down the tunnel to where some big valves in the steam pipes along the wall hid them from view. A flashlight beam shone down through the opening for a few moments, and then a sturdy-looking suitcase was carefully lowered with a rope. This was followed by a small roll of wire. Seconds later a pair of well-rounded legs in toreador pants came down through the opening. At this point the flashlight was turned off, and the boys could hear the hatch cover being put back in place. Next there were some fumbling sounds, and then a row of tunnel lights came on. Fortunately the lights ran on down the tunnel from where the intruder had descended and did not reveal the boys hiding in the shadow of the big valves. "Holy haddock! It's a girl!" Jerry whispered. It was a girl, all right, a very pretty slender one with dark curly hair and almond-shaped glasses. With quick, graceful movements, she opened the suitcase to reveal a panel full of knobs, dials, and metes. Then, unrolling the coil of wire which led down from the hatch, she fastened the end to a binding post on the panel. Wire from another binding post was clipped to a valve in a steam line. Then she replaced a lamp bulb above her head with a Y receptacle that accepted both the bulb and a plug on the end of a wire leading to the suitcase. And finally, she seated herself cross-legged on the floor in front of the opened suitcase and plugged a telegraph key into a jack on the panel. "Hey, that's a portable radio station! She's getting ready to send a message. I'll bet she's a spy," Jerry whispered. "She's pretty enough to be one. What are we going to do - ?" Jerry had no opportunity to give an answer if he had one - which is doubtful. The girl threw a switch and closed the key , and instantly a loud, over-loaded squawk came from the little radio. Carl still clutched in his hand. He dropped it, stunned by the sudden noise, and lunged backward into Jerry. Both boys toppled into the light. The girl gave a little shriek and leaped to her feet. But when she saw Carl and Jerry staring sheepishly up at her from where they sprawled in a table of arms and legs on the floor, she gave a giggle of obvious relief. "Oh, it's just boys; I was afraid it was a nasty old mouse," she said in a rich Southern drawl. "I really wish you'd get up from there. You all can't imagine how silly you look just lying there staring up at me. Didn't you ever see a girl before?" Suddenly her soft brown eyes grew dark in anger behind her glasses. "And you might explain why you were spying on me!" "We were spying!" Jerry sputtered indignantly. "I like that! I suppose you weren't starting to send a secret message to one of your comrades." The girl's eyes opened very wide. "Secret message - " she repeated, and then became convulsed with almost hysterical laughter. "I swear you Yankee boys are wild, utterly wild," she said finally as she leaned weakly against the wall of the tunnel. "You won't understand, but instead of being Mata Hari, I'm a radio amateur. This is a portable transmitter and receiver and I'm getting ready to talk over the air to my daddy down in Florida, as I do every Friday night at this time. "I can't operate my transmitter in the residence hall," she continued, "but I discovered this place by accident late last fall when some men were working down here and had that cover off. I've used it ever since. It's warm; there's power available; and I can string my antenna from a fire escape nearby down through a crack in the hatch cover - but you wouldn't understand about antennas." "We might," Jerry said with a grin. "We've both had our ham calls for several years. My name is Jerry Bishop, and this is Carl Anderson. We're both freshmen in EE. We just happened to be exploring the tunnel when you - 'dropped in,' shall we say?" ""My name is Jodi, Jodi Preston, also a freshman in double-E," the girl said as she held out her hand; "but if you'll excuse me, I'd better call Daddy now. He'll think the Abominable Snow Man has made off with me up here in the Arctic wastes, as he calls anything north of Atlanta." The boys watched while Jodi expertly tuned up the little transmitter and gave a snappy call to a W4 station. The W4 came back immediately. Used to copying in their heads, the boys followed the ensuing conversation easily, even though the girl was handling the straight key at a clean, rhythmic twenty-five-words-per-minute. It was chiefly family stuff: how Jodi's dog missed her; that the box of cookies arrived okay; and that Jodi was going home with her roommate during spring vacation. She made no mention of Carl and Jerry. "Well," she declared, as she signed off after a lingering 88, "That's that for another week. Now I've got to get this stuff together and scamper back to the residence hall before the curfew hour." "We'll help," Carl offered; "but why di da girl like you ever come to a technical school like Parvoo -"
"Stop right there, Yankee boy!" Jodi said with her brown eyes flashing angrily again. "I know what you're thinking; 'She came because the eds outnumber the coeds and it's easy to get a man.' Well, if I wanted a man, which I most certainly don't, I'd never look for one in Yankeeland. I came to Parvoo because I'm deeply interested in electronics. I want to know more about it, and I think this is the best place to find out." "Okay; so okay!" Carl said soothingly as he would up the antenna wire. "I wasn't thinking any such thing, but let's not make a fed - I mean a confederal case of it. Jerry, I'll go up an see if the coast is clear. You hand the transmitter up and join me. Then we'll give Jodi a hand." As they lifted Jodi easily to the sidewalk the boys, being engineers, could not help noting how neatly her hundred and twenty pound were packaged. They had just replaced the cover and wound up the antenna wire when a campus police squad car turned the corner and cruised by. "Whew, that was close!" Carl said as he picked up the transmitter and the three of them set off through the still war, star-studded night. When they arrived at the X-Hall where Jodi lived, just on the other side of the Co-Rec Gym from H-3, she took the transmitter from Carl and the coil of antenna wire from Jerry and said, "You boys have been just as sweet as you could be, and I'm sorry I said such hateful things to you. I had no idea Yankees could be so nice. Are you boys sure you don't have any Southern ancestors?" "My folks came from Pennsylvania, darn it!" Jerry confessed. "And mine from Minnesota, double darn it!" Carl added. "Now you're making fun of me, but I don't mind," Jodi said, bathing them in a warm smile as she turned reluctantly toward the door. "Anyway, we're all hams, and that means a lot." Carl and Jerry started off briskly. "Hey , Jer, you know something?" Carl asked as he leaped into the air to pluck a leaf from a tree, "that Jodi is a nice kid even if the can't pronounce an r."
"Yes, and she has a beeyouteefull fist," Jerry agreed. "Say, I don't know about you , but I feel a lot more relaxed after our tunnel stomping. What say we go home and tear into the books for a couple of hours before turning in?" "Let's go!" Carl said, breaking into an easy jog.